In the original post for baile viernes, explains how our tradition started with having a dance video projected during passing time on Fridays. Some students RUN to class to get the chance to dance. I typically try to pick one video that is used in all classes for the day. I have Youtube playlist with enough videos for years. After the bell rings we may reply the video if there is interest. The reasoning for Friday is as well all know there is a LOT of extra energy and this dancing helps to get out the Friday wiggles. Resources I have for baile viernes in Spanish: 1 Full year of Baile viernes (NEW! ), baile viernes bundle (includes baile viernes, baile viernes 2 & baile viernes 2017), baile viernes - middle school & 1 year of middle school dance & music. By request I also have a brand new dance resource for FRENCH teachers! La danse de vendredi gets your French classes in on the fun. (A big thank you to awesome French teachers Megan Sulewski & Wendy Farabaugh for your feedback and editing skills). I have been really into using brain breaks to split up my class for overall better engagement. This post has a ton of ideas on what to use for quick breaks that get the brain reactivated and ready for the second set of input. A go to activity for classes who love baile viernes is they request to do a dance video. 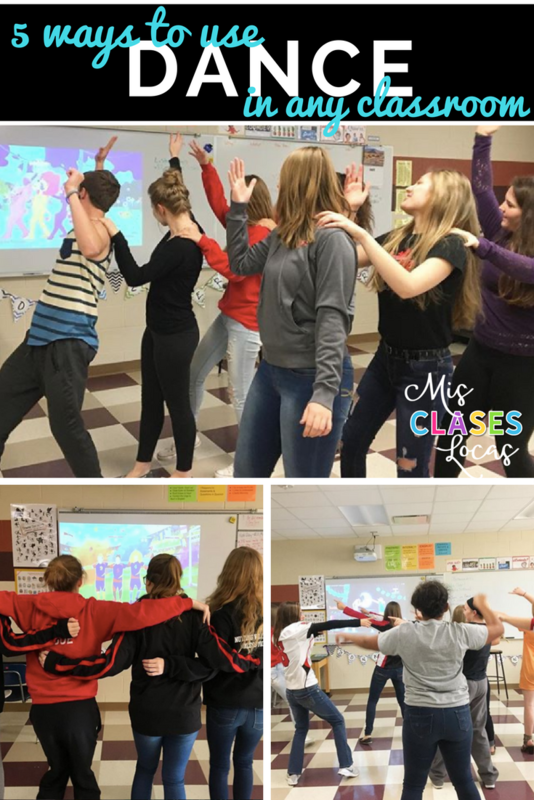 In similar fashion I project a video (my students this year love all of the Just Dance videos in Spanish), students dance, and we move on with the next activity. You could also do the video cantaninja style, where a student gets to pick when to watch or dance to a video. This can be a rotating student job. Besides just playing a video, I know a lot of teachers have had great success actually teaching their students an authentic dance. This site from the Kennedy Center has unit resources, videos and standards about using Latin dance in the Spanish classroom. Are you starting a unit on Argentina? Use basic Youtube videos (or even a real person if you have access) to learn the basic steps of the tango. Using the book Felipe Alou set in the Dominican Republic? Teach about Merengue using this unit and actually learn to do it. Do you teach little guys? Try the basic Mexican Hat Dance. I taught this to the Kindergarten class in our school. When students actually experience the language in context, they are more likely to remember it. 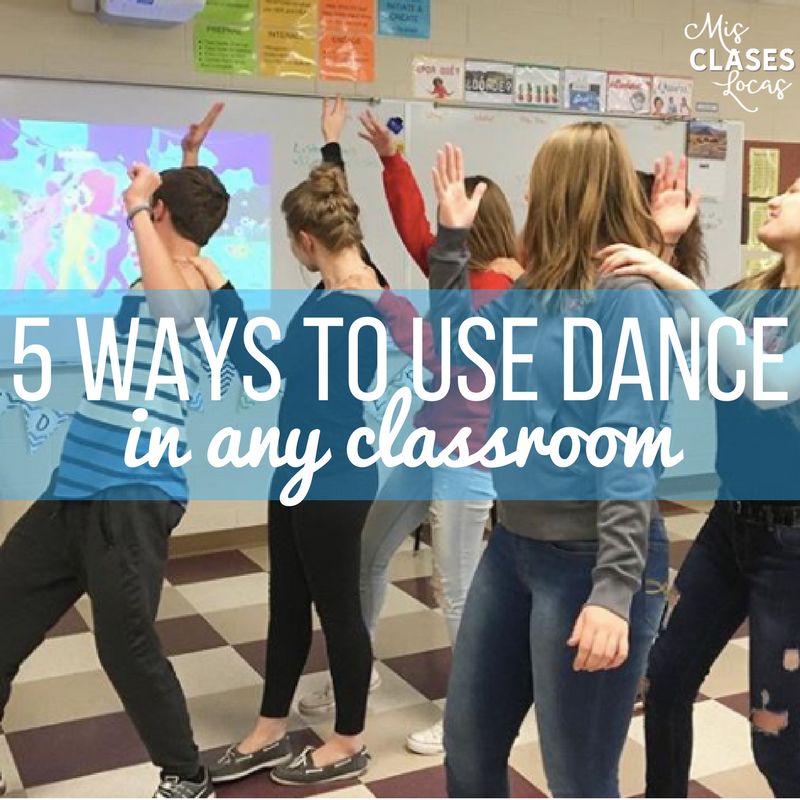 Some classes love to dance so much they will beg for more after one dance to start class or a brain break. My typical response it that if there is extra time at the end of class, they can dance. Often students work hard, get their work done and then get to use the last three minutes to dance. It is a win win. Students work hard, are rewarded with a positive activity, and we have something happening until the final bell. It could also be used for schools that have PAT or Preferred Activity Time. Students earn time during the week for positive behavior that is rewarded in the last 15 or so minutes of class Friday. Have you ever had a day when there is an unexpected assembly, testing or some other interruption which means classes will be 15 minutes, or you will only see one section of two? Dance is a positive use of this time when requested by the students. I once had ever single seventh grader in my room dancing for a full thirty minutes for a filler after an event on a day before break. Have you had to supervise inside recess? Put on some dance videos and get that energy out. Here is my Dance Play list in English, Dance Play list in French & Dance Play list in Spanish. Do I force everyone to dance? No. The thing is even those who chose not to dance enjoy being a part of the class culture. Are there students who pay to go to a school dance and never actually dance? Absolutely. Just because someone is not up front dancing, does not mean they do not enjoy being a part of the class community. How do you "sell it"
I work hard to create a positive classroom environment, and this means being ok with being vulnerable in front of peers speaking in Spanish, making mistakes, being goofy, and even dancing. I think that this supportive and positive community is essential to making dancing successful in any class. I dance with my students, never taking myself to seriously and having fun with them. I know a lot of teachers like to dim the lights and shut the curtains to make it more fun and less embarrassing to those not in on the class secret. Just like everything in the classroom, those of us that take big risks, have both great success and huge flops. Like anything in the classroom, learn from our mistakes, tweak it, and try again, hopefully with better success. The time of day is huge and afternoon classes are ALWAYS more into dancing. I had a group of Spanish 2 students last year after lunch that were notorious for getting every single person in class to dance every Friday. I have those exact students (plus more) in Spanish 3 this year 1st hour. I play the video and they just sit there, not able to function well at 8am. I don't take it personal, we just go about business and sometimes at the end of class they are awake enough to want to dance. Do your students dance? Please share how & use #baileviernes & tag me on social media!